Addendum to yesterday’s ‘A Bear in the River Valley‘: Stewart Steinhauer very kindly provided the following background for the sculptures in Rossdale. It seems he is as eloquent and charming a writer as he is a sculptor. “The typical mother and child motif is actually a riff on my Cree ancestor’s notion of earth as mother; the little figure in her “lap” is a character from an Ojib-Cree ceremonial story, part human and part eagle, in transformation. The whole thing is metaphorical, like most “simple” Cree stories. A sustained reading will take you down the what the bleep rabbit hole, but that reading requires getting right into the ceremonial space. Really lovely. 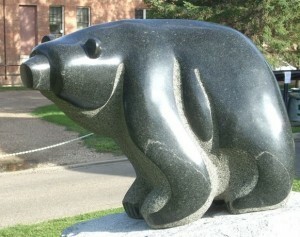 Thank you Mr Steinhauer, for your thoughtful words, and the beautiful granite creatures that inhabit the river valley. I feel very lucky indeed to be here, now, especially when I’m walking in the river valley, amongst the trees and bears.